Preheat oven to 350°. Put cupcake liners in cupcake tray (this recipe makes 24 cupcakes). In large bowl with electric mixer, mix together on low cake mix, dark cocoa, cherry pie filling, eggs, and rum extract. Mix on medium for 3 minutes. Scoop batter into cupcake papers, evenly distributing batter for 24 cupcakes. Bake for 18-21 minutes, until center of cupcake is set. Cool completely before frosting. Whip butter until light and creamy. Mix in half the powdered sugar. Mix in vanilla and milk. Add remaining powdered sugar. Whip well. Pipe onto cupcakes. 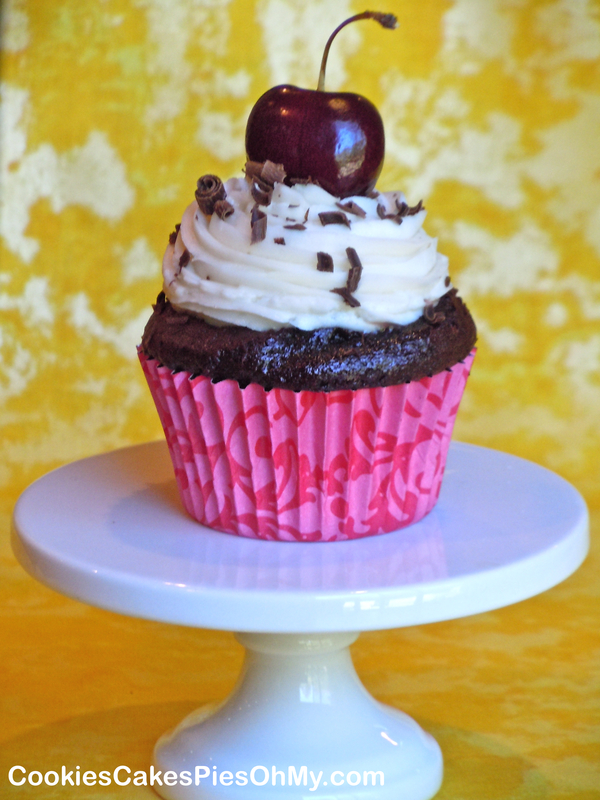 Garnish with dark chocolate shavings, mini chocolate chips, chocolate jimmies, maraschino or bing cherries. These cupcakes look amazing and Im excited to make them! Can you tell me if you make the cake mix according to direction first? Im worried this is not enough liquid, otherwise. It does seem that way, but the pie filling and eggs together does make it work. 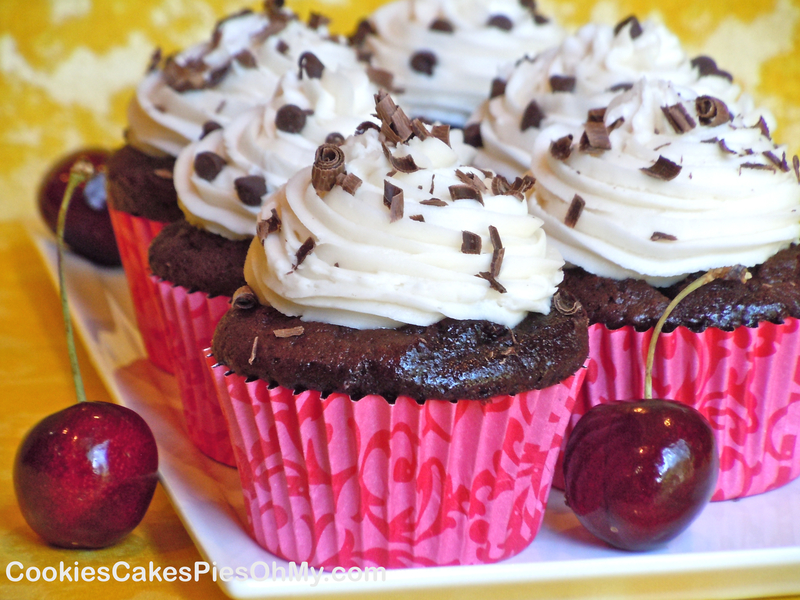 It is a little thicker batter but the cupcakes come out very moist. Hope you like them, thanks for stopping but my site! I made them before I read your reply and I added some water because it seemed to thick. My 17yr old son LOVES them and cant stop talking about them. He wants to share them with his GF, at school tomorrow. Next time Im gonna trust you and not ad the water….Thanks so much! I made these for a potluck at my husband’s office, and they turned out great! Thanks for this awesome recipe! I’m so glad! Thanks for visiting my site! Happy Baking! I have made these twice, using different types of chocolate cake mix, and both turned out excellent! I really love the frosting recipe included too! Definitely my go-to fancy cupcake recipe! Thank you so much for writing it! So glad the recipe works well for you! Happy baking! Can these be made the night before, or will that ruin the frosting? Thank you for your time! Making them the night before will work great. You can put them in the refrigerator if you would like, but covered at room temp they will be fine too. Thanks for visiting my site. Happy Baking! I’m making these right now, but I am putting the cherry pie filling in the center instead of in the cake mix. The cake mix is very thick, will these still bake correctly? Thanks. Sorry my response could not be instantaneous, as you were baking. The cherry pie filling is definitely an important part of the batter for the cupcakes. I would really like to print the recipe without printing the whole 7 pages of the post. Is it possible and I’m just missing something? I see what you mean. I use wordpress and the format that comes up when you hit print is messy! Sorry it is like that. What I would do is click to select the full recipe, copy and paste in a word document then print. Wish I could be more helpful. Happy Baking!